Oh, Once Upon a Thread! I love this series. In fact I have been thinking about it for well over a year when an idea popped into my head... I had to drop Katy a line and let her know I was ready to go if she ran the series again and had room for me. I'm so thrilled she did! Thank you Katy for inspiring me with everything you do--as a mother and artist. 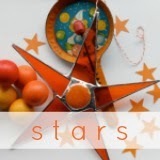 Your eye for detail is as remarkable as your design flair and your ability to nurture your houseful of beautiful children. Since participating in Once Upon a Thread the first time I find myself repeatedly thinking of children's books as sewing inspiration. 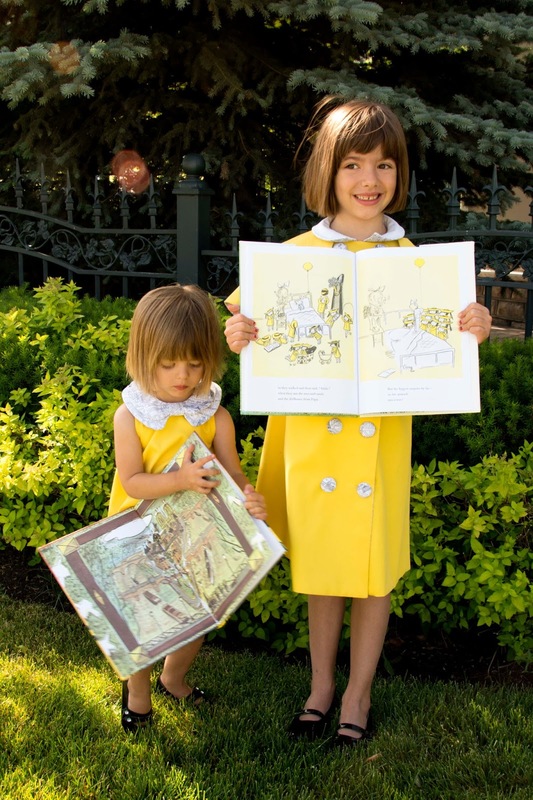 Such a great way to combine two of the things I really love doing for my children: reading and sewing. 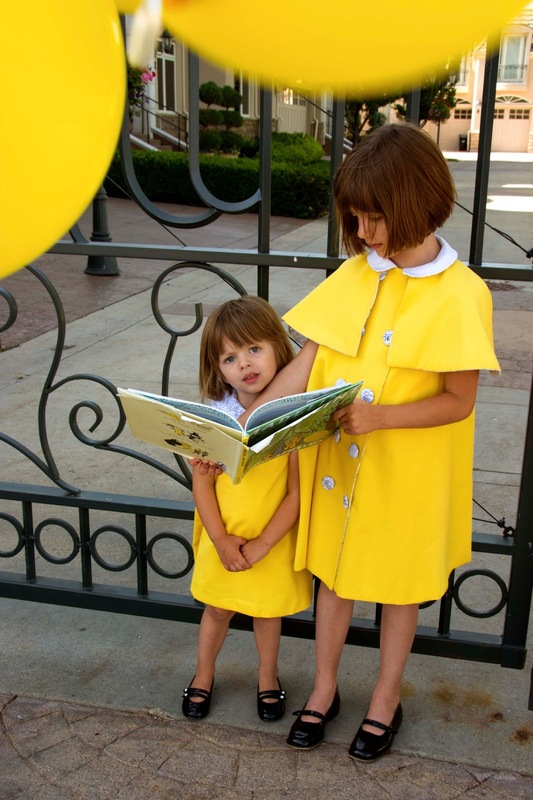 So, this time I sewed a pair of dresses inspired by Ludwig Bemelmans' "Madeline." Though it's hard to say where the inspiration started. 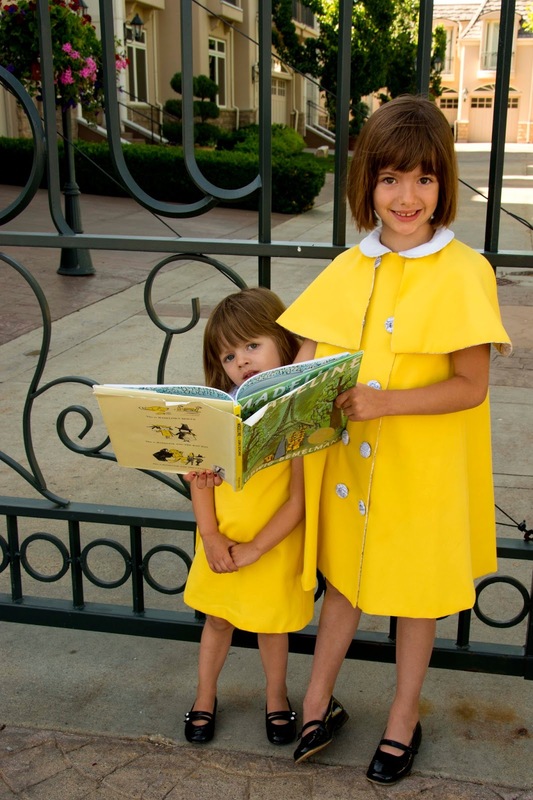 I collect vintage sewing patterns and came across this old Simplicity pattern (#5427) for a darling double-breasted a-line dress with capelet and it reminded me of the yellow coats with capes the twelve little girls wear in the book. I just needed the right yellow fabric. 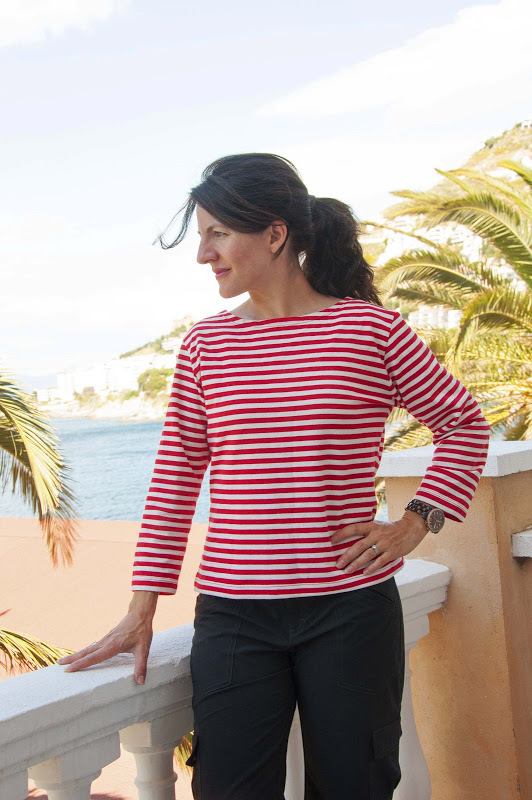 I love pique, and I love the way European clothing uses it for babies and children, so I thought it would be perfect, but it's difficult to find... I did however find the fabric I was dreaming up for the lining: Lloyd + Barton's Paris map fabric for Timeless Treasures (via Etsy)! 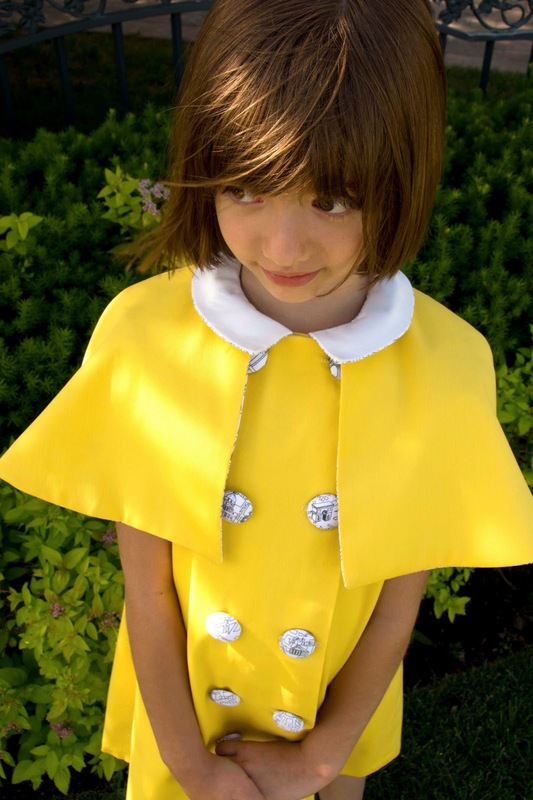 And then in the nick of time I found some vintage fine wale Madeline-yellow pique on eBay. Amazing. 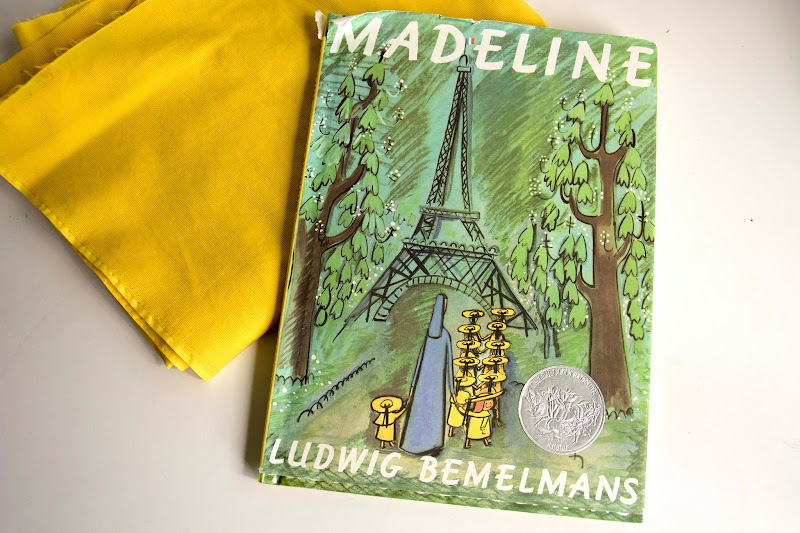 We love classic children's books at our house and "Madeline" is a favorite. 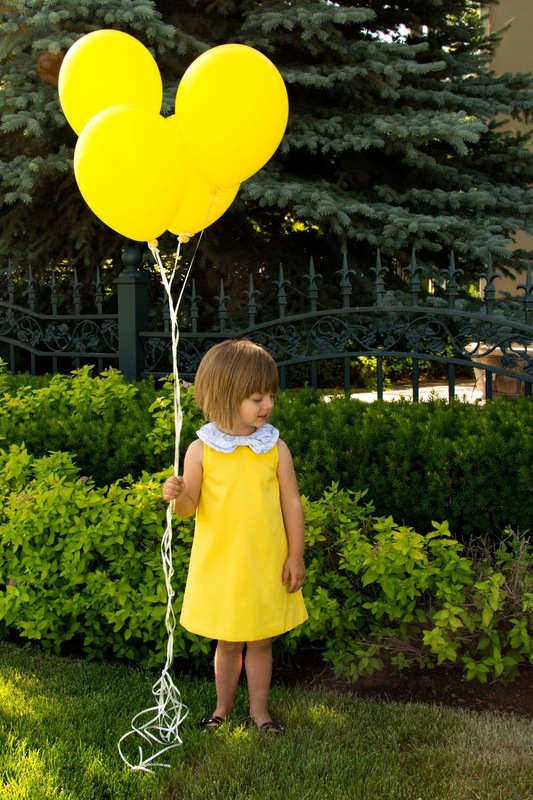 How can you resist this petite little girl who is kind and brave and creative? My girls giggle every time Madeline says "poo poo" to the tiger in the zoo. 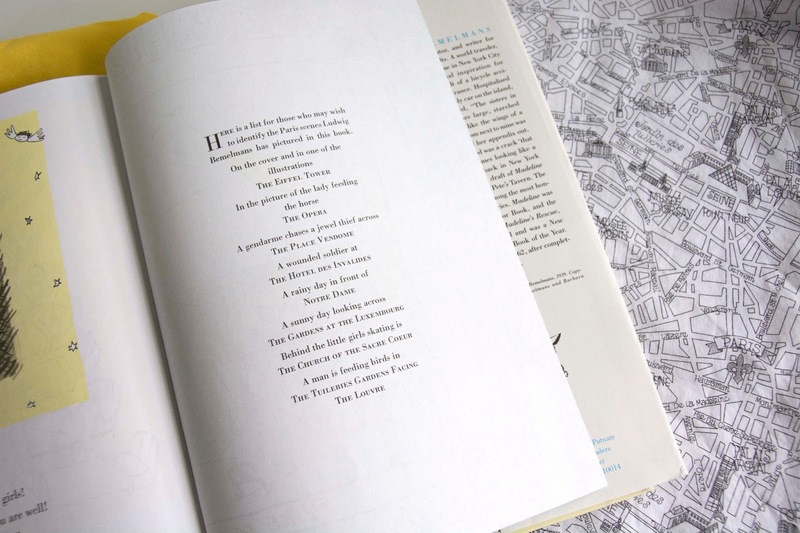 And I love reading aloud the rhythm and rhyme of this prose, even when it isn't quite perfect. 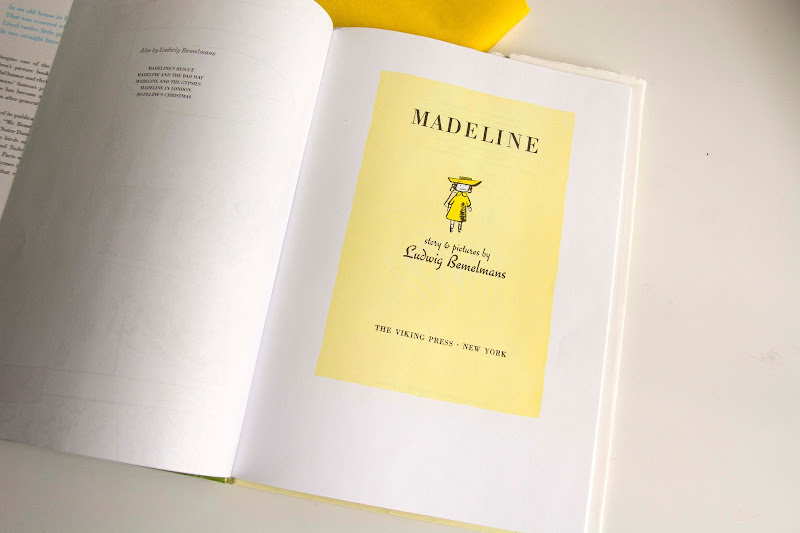 We have a few of the Madeline books, but I think the first is the best. Though we feel a bit sorry for these twelve darling girls for being sent away to boarding school--they wouldn't even see their parents at Christmastime if it weren't for a bit of magic (see "Madeline's Christmas.") Miss Clavel does seem nicely firm and plenty concerned about their well-being but still, it must be difficult to be away. There is some entertaining non-fiction to this little story. 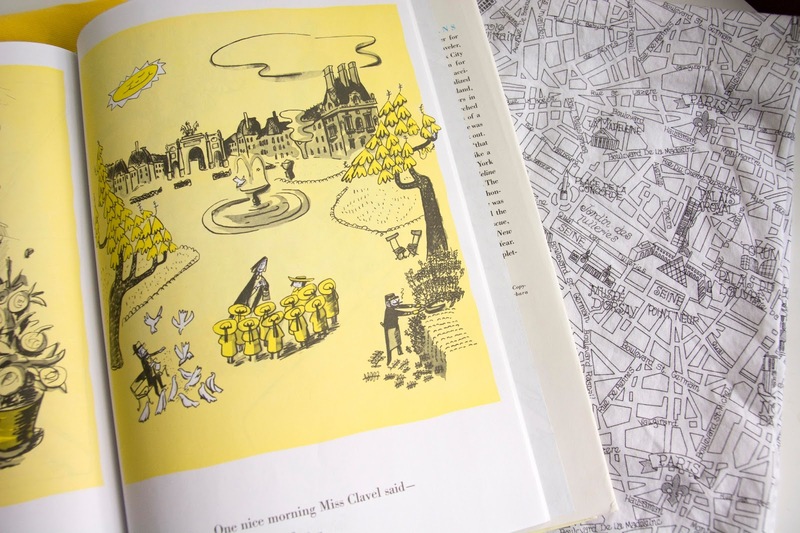 I love the Paris attractions that serve as the background for Madeline's adventures. It was nice of the publisher to include a list of the locations in the back of the book. 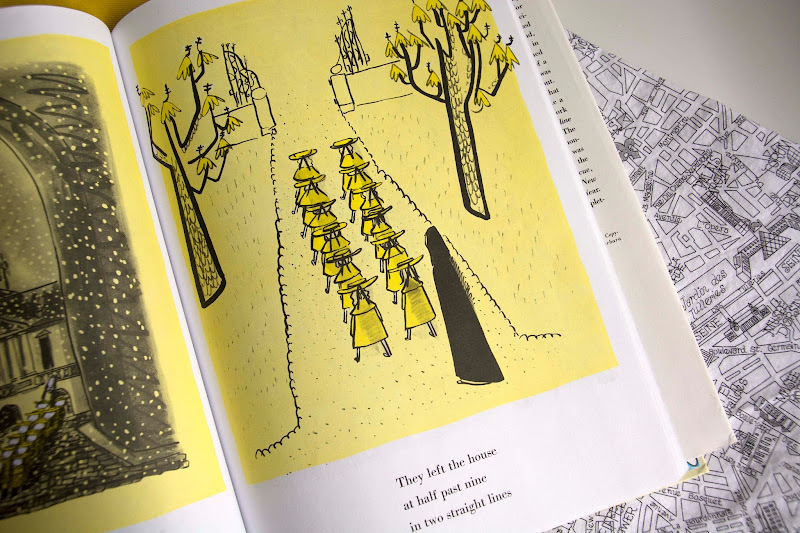 And I discovered that Ludwig Bemelmans married a woman named, "Madeline," who I imagine was the inspiration for his main character. It would have been fun to whisk away to Paris for a photo shoot in the Jardin des Tulleries by the Louvre, but we settled for a quick morning field trip to some local wrought iron before a morning of summer camps. And a challenge to see who could name the Paris locations appearing on Audrey's and Tess's covered buttons. If our only zoo had wrought iron cages (purely an aesthetic wish, nothing else) so we could have visited the Tigers. The more I think about it, "Madeline" includes many of the things that continually inspire me: European children's clothing (reminded of this skirt), little girls (foremost my own three), Parisian wrought iron (was thinking about it for this party), art, and classic literature. 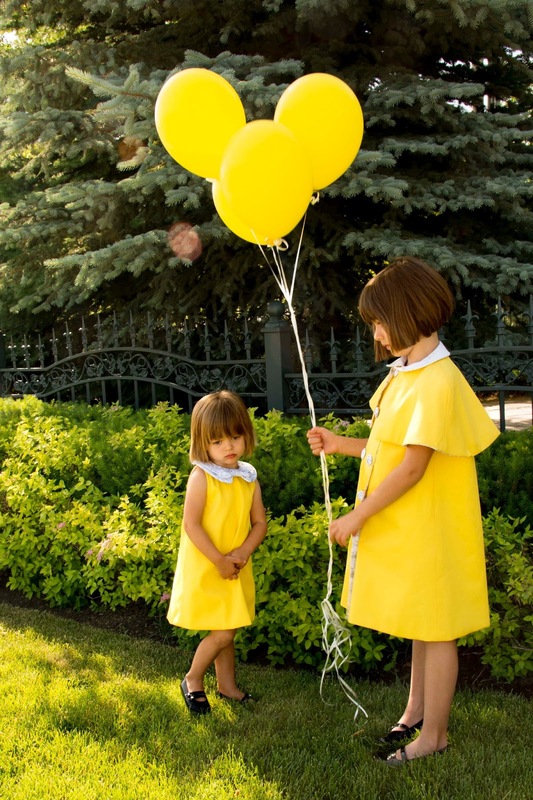 In that regard these yellow dresses are long overdue! 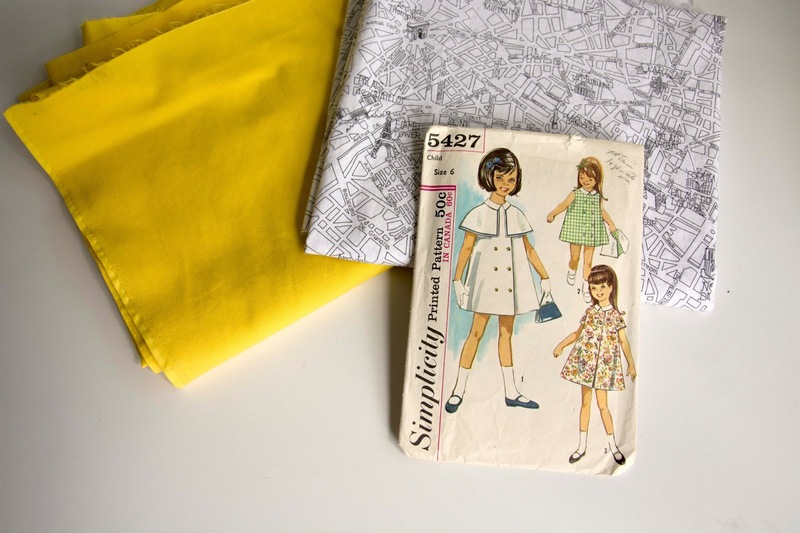 My plan was to sew the caped dress for Audrey and end there, but I enjoyed the combination of the bright yellow and the black and white map print so much I couldn't resist making another. 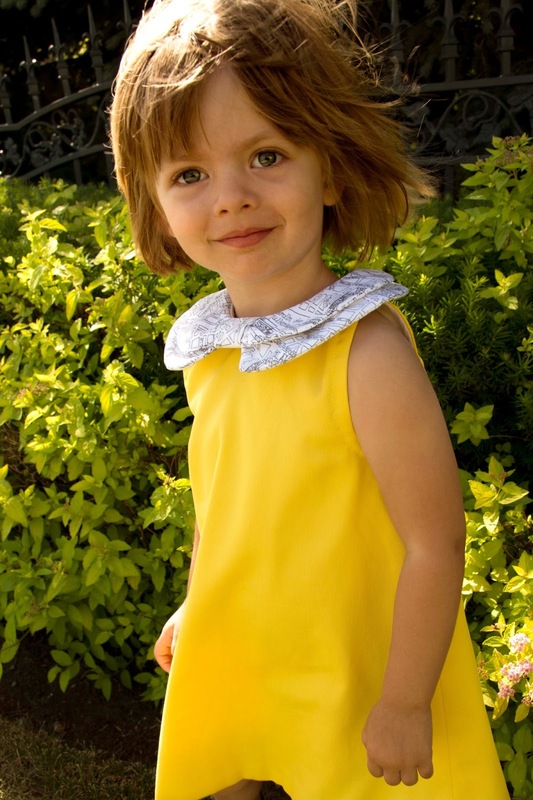 So I made a dress for Tess with a double-bow collar inspired by some of my favorite European children's clothing. ...but it is the end of this post. Thank you again, Katy! I can't wait to see the other chapters in this series. Anneliese, I think Scarlett needs to make another guest appearance here before chapter 4 ends....hint, hint ;) The baby wale pique, the map print buttons, your girls! I don't think we even need to see the book to guess which one you chose. Perfect. Thank you, Anneliese! 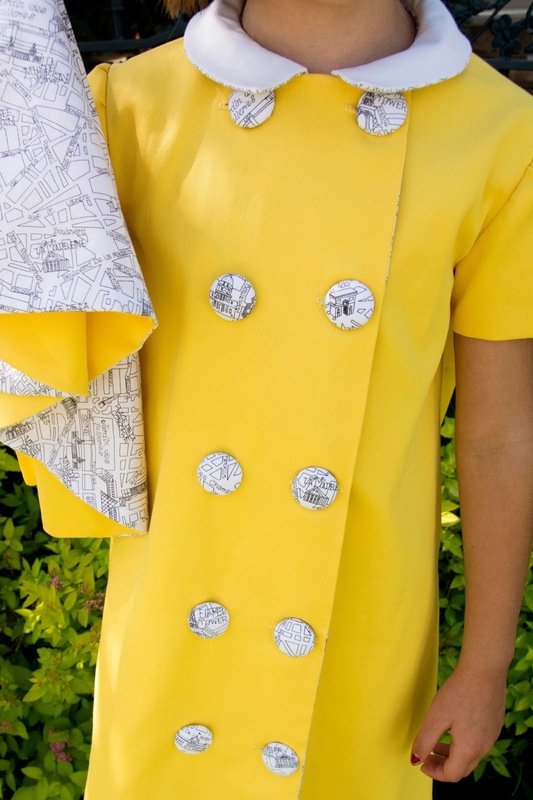 That map fabric is the most fantastic compliment to this dress! Love it! LOVE these. 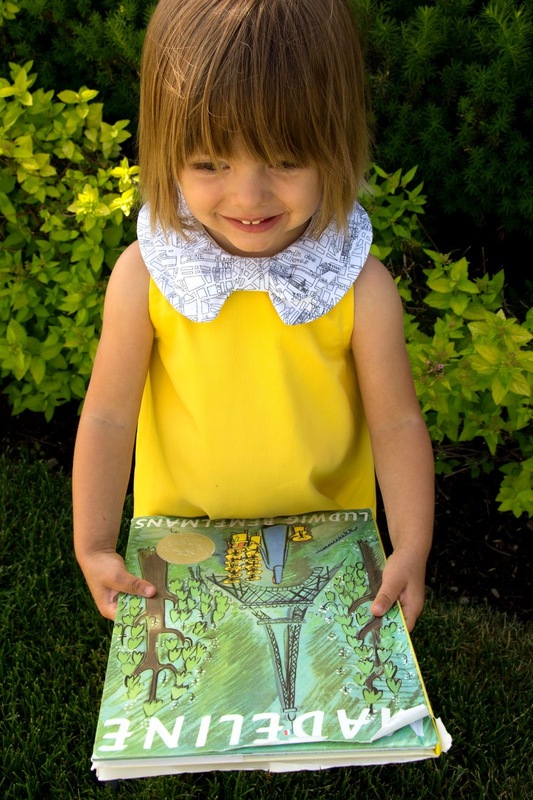 My daughter adores the Madeline books, too. She would love this! This is perfect down to each detail! Love it. I loved those books as a girl too. 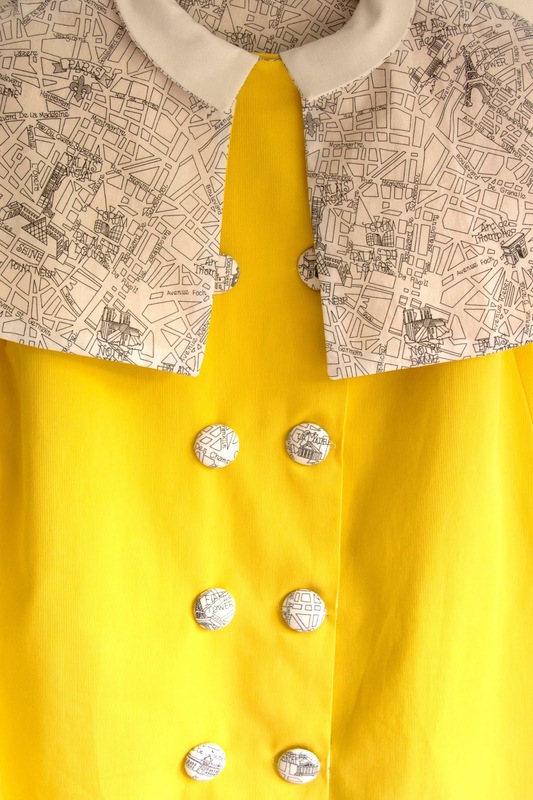 The map fabric...just the right touch. Nice work Anneliese. Oh my goodness. Adorable. I LOVE the buttons and collar, such a fantastic touch. Well, this is just positively perfect, isn't it! I love all of it and I want to rescue those adorable girls from the orphanage myself! Oh, I love it! One of my favourite books, I just shared it with my daughter a few weeks ago. The buttons are the icing on the cake! 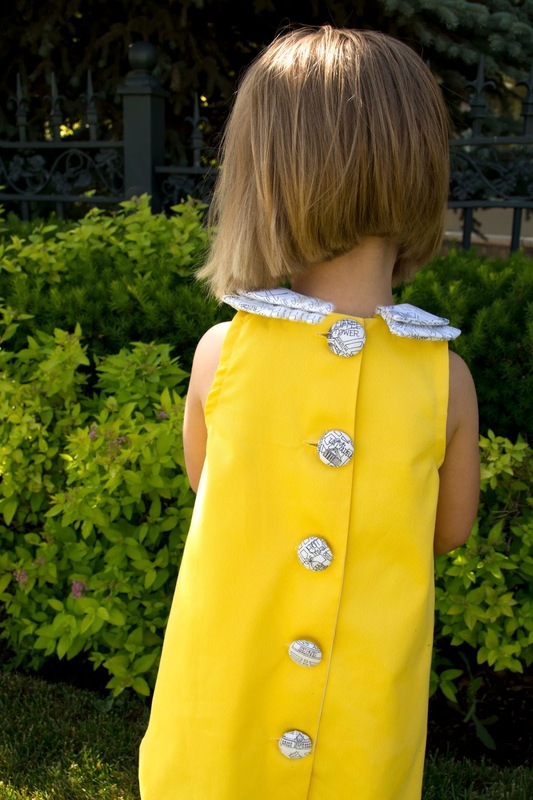 The lining and the buttons are the perfect compliment to that yellow. Well done Anneliese! Love this series Katy! Very beautiful Anneliese! When I saw only Audrey and Tess, I started flipping through the post looking for Scarlett. Cant wait to see what you think up for her. On Tess's dress, did you use your Chemise pattern for the dress part? @GrayColors: :-) I know! Just doesn't seem right for Scarlett to be left out. I'm going to give it a try. And yes, very good guess, I did a variation on the Chemise pattern for Tess's dress. How perfect! Love the black and white print contrasting fabric.